Cost to clean an acoustic ceiling varies greatly by region (and even by zip code). Get free estimates from local contractors in your city. Cost to clean an acoustic ceiling varies greatly by region (and even by zip code). How much does it cost to clean an acoustic ceiling? Acoustic ceilings are made up of tiles designed to insulate a room and absorb sound. They’re typically installed in office buildings, but also in homes where a quiet room or space is needed. Unfortunately, over time, acoustic ceilings, particularly the old-fashioned porous type, can absorb things like grease, cigarette smoke, bacteria, and dust, turning them a dingy gray or brown color. Water leaks can also stain an acoustic ceiling, creating large, unsightly blotches of color where the water sat. While 50 years ago it wasn’t possible to clean an acoustic ceiling without causing the tile to crumble and leaving behind a number of spots and stains, cleaning methods have changed and it is now possible to clean your ceiling, rather than replace it when it becomes dirty. Cleaning your ceiling is much more cost effective than painting or replacing it. The average person will spend around $150 to $350 on a 1,000 sq.ft. ceiling. The type of acoustic ceiling that you have, as well as the condition that it’s in can affect the total cost. However, heavily stained ceilings or ceilings that contain asbestos and that need specialized care may cost more. Many years ago the only way to deal with a stained or dirty ceiling was to replace it. Because acoustic ceilings are made of tiles, many people simply chose to pull down the affected tiles and put up new ones, simply because cleaning was often so ineffective. Now, however, cleaning your ceiling is much more cost effective. It’s estimated that cleaning will cost roughly ⅓ of the cost of replacement. So while you may spend $150 to $350 to clean your ceiling, you will spend $1,000 to $5,000 to have that same ceiling replaced. 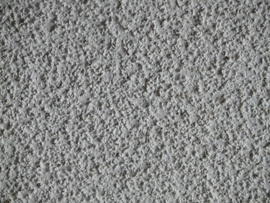 Organic enzymes are sprayed onto both porous and nonporous ceiling tiles. They break down the dirt and stains organically, and may be sprayed under pressure to reach further into porous tiles to help break down soil from within. Non-porous tiles must be wiped or brushed after being sprayed; porous tiles may be left alone after spraying. One gallon cleans approximately 1,000 sq.ft. and costs around $40. Oxidation reduction is a chemical treatment containing hydrogen peroxide sprayed onto the ceiling tile in a light mist. It’s primarily used on porous ceiling tiles and chemically lightens the stains on the tile. There is no scrubbing or wiping required. Three liters are required to clean 1,000 sq.ft. and costs about $45. Most cleaning companies that deal in acoustic ceiling cleaning charge between $0.15 and $0.35 per sq.ft. or around $150 to $350 for a 1,000 sq.ft. ceiling. This involves the taping off of walls and fixtures, covering the floors and furnishings with drop cloths, spraying the cleanser onto the ceiling, and any wiping, brushing, or other renewal methods necessary to remove the stains and clean the ceiling. Most ceilings will be cleaned within three to four hours including setup time. Some types of acoustic ceiling 1 panels are made to be painted. A fresh coat of paint can cover stains and improve the looks of the ceiling. Painting a ceiling costs around $400 to $800 for 1,000 square feet. Porous ceilings cannot be painted. It is recommended that an acoustic ceiling 1 be dusted or dry brushed about once every 4 months to prevent stains. Obvious stains and deep cleaning should be done on an as-needed basis. Some stains can be removed DIY from your ceiling. Keep in mind, however, that some acoustic ceilings 1 contain asbestos 2 and should be tested and left to the professionals to avoid releasing asbestos 2 fibers into the air. For new ceilings, dusting can be done DIY and small stains can be removed by spraying on an oxidizing cleanser as needed. 2 Asbestos: A group of fire-resistant silicate minerals found in construction materials including paint, particularly in older homes. When the asbestos deteriorates, particles can become airborne and this is a serious health hazard. How much does it cost to clean an acoustic ceiling in my city? Cost to clean an acoustic ceiling varies greatly by region (and even by zip code). To get free estimates from local contractors, please indicate yours.